Revised version of the popular Echo Dot. This most popular echo device is now even better, with a new design and more powerful speaker. 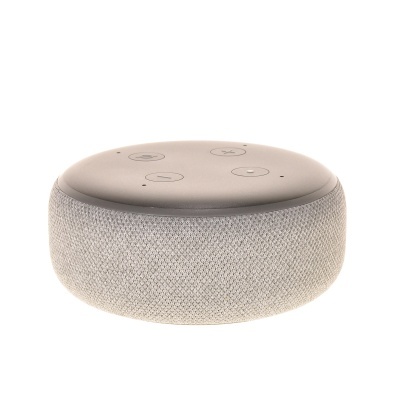 Echo Dot is a speech controlled intelligent speaker with Alexa and ideal for any room. Just ask for music, news, information and more. You can also call people who have an Echo device or the Alexa app (Skype coming soon) and control compatible smart home devices with a voice command. Ask Alexa for a song, artist, or genre on Amazon Music, Spotify, TuneIn, and other services. With multiple compatible echo devices in different rooms, you can listen to music all over the house. Listen to Audible, radio stations and more. Make life at home easy for yourself. Use your voice to set timers, keep lists, or create calendar entries and reminders. Listen to the news, the weather report or traffic information. Ask for sports results, cinema programme, opening hours of restaurants and much more information. Spotify is a commercial music streaming service providing DRM-protected content from a range of major and independent record labels, including Sony, EMI, Warner Music Group and Universal. Edition 04/2019 - Die mittlerweile dritte Generation des Amazon Echo Dot hinterlässt gerade noch einen befriedigenden Eindruck im Test. Dies liegt zum einen an einem nur mäßigen Klang, vor allem aber auch die deutlichen Mängel in den AGBs und in den Datenschutzerklärungen sind hier kritisch zu beurteilen. Die Sprachbedienung per Alex gelingt hingegen gut und auch in Sachen Funktionalität hat der Echo Dot einiges zu bieten.